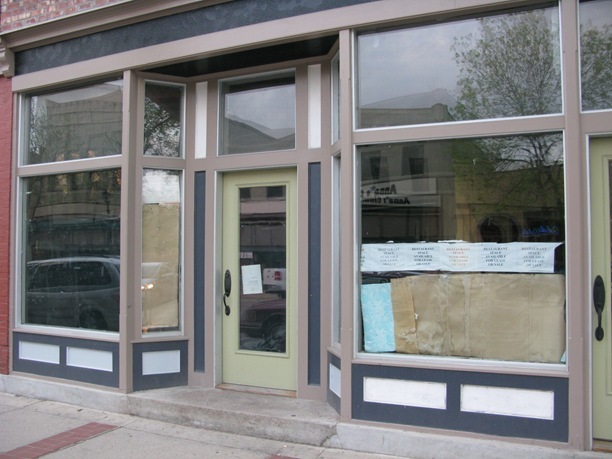 Why not for downtown Northfield, since there are a number of empty or soon-to-be-empty storefronts along Division St. right now? A revenue stream for the owners! Previous PostWhither SpeechGear and the promise of jobs?Next PostAnyone missing a parakeet? understand why they don’t go a little bit further, so I don’t have to keep going to other towns to spend my $$$. never once have I gotten anything except from PJs Fabric Store, who is not downtown, but works very hard to get customers what they need and what they want. I have even offered my own site to people, free, to promote their business and no one took me up on it. It’s a shame that the gangs will soon be running this town. As I walked past the old Dahl House last week, my thoughts mirrored this article. The boarded up “Pardon our Construction” (which has been there for 5 or 6 years) and all the white signs are an eyesore. While a comment was made in some blog last week about the old Tires Plus building, I think this is worse and is on the main corridor of shopping. A lesson could be taken from shopping malls where they put a nice display in the window of closed stores. 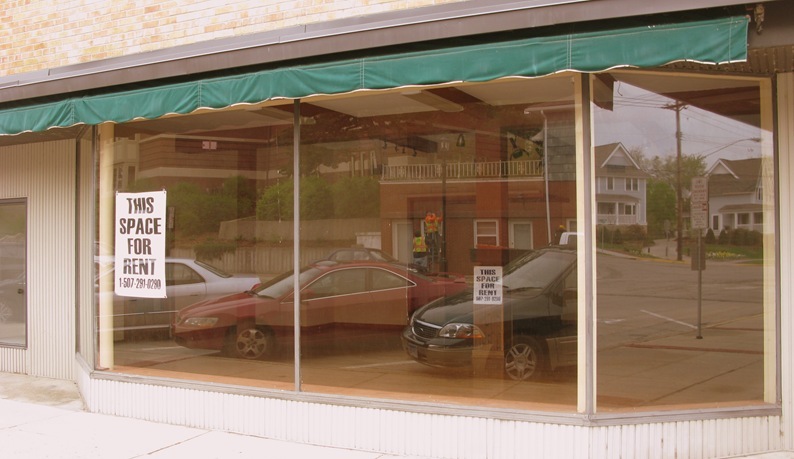 Why not allow non-profit organizations etc to put up displays in the windows. It would be more attactive and do some good at the same time. I know signs are needed to rent out a building, but there doesn’t need to be anything quite that huge. Prospective renters know the building is for rent or are looking for ones available if they are interested in starting a buisness. 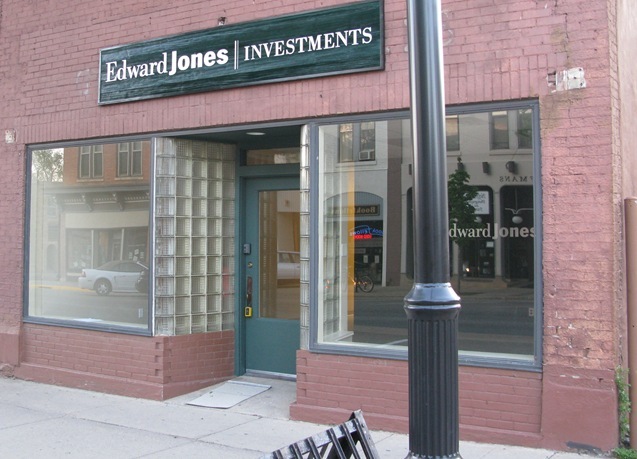 As far as keeping empty storefronts looking presentable, I quite like what Edwards Jones Investments has done with the former record store. Cindy, I don’t know why the plywood has been there on Summa’s building (the Bagel Bros side) all this time, but maybe Kiffi or Victor can explain. 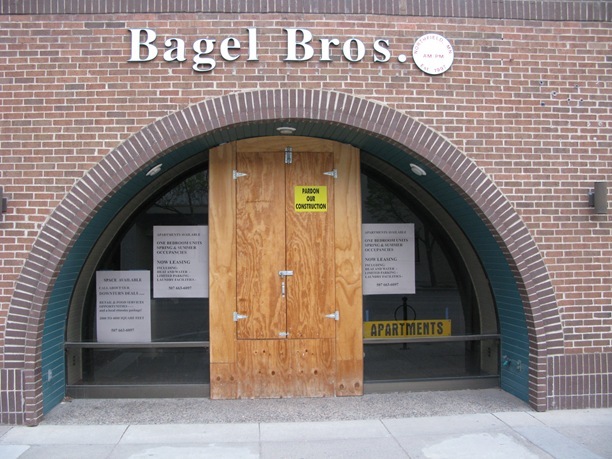 When the Bagel Bros business owner went bankrupt, the IRS felt they were the owner of all the assets of that business, and would not let anything be touched, in case they wanted to claim all of the equipment. 1. It takes quite a long time to move things through the bankruptcy court. 2. After that the IRS would not answer any calls as to their claim on the equipment or the disposal of same. 3. For at least a year after the court procedure we were prevented from doing anything with the space because of the IRS claim. 6. The last huge piece of equipment went out the end of last week, also through the construction window. I heard that the bagel place was quiet good. Anyone know why it went under? It seems that a town like Nortfhield could use a place that sells bagels and such. Not a very nice proposition in these difficult times. 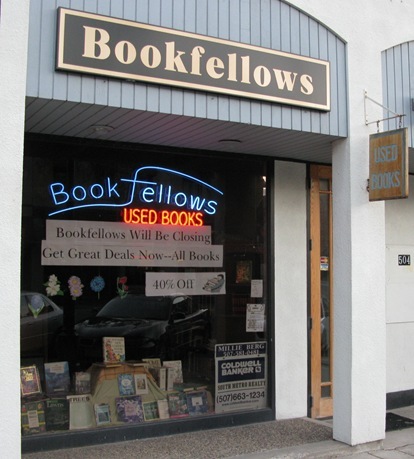 There is now a huge space there, with both this and the bookstore now vacant. It seems like a good location with good foot traffic. I hope something comes along soon. Perhaps have some ArTech folks come down and do a small mural on the plywood? Right now in St Paul, they have Art Walk going on, and all of the children art is displayed in the empty storefronts. It is actually quite wonderful. 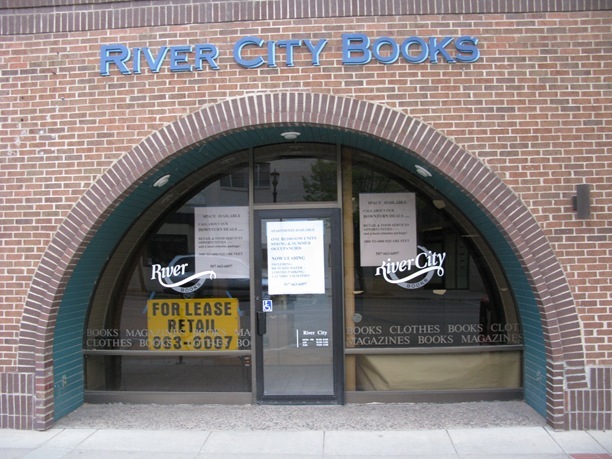 Why isn’t anyone worrying about why all these stores are leaving downtown Northfield? Isn’t anybody in the city government/chamber of commerce doing anything to bring in more businesses to downtown? Otherwise Northfield will become like every other cowtown in the midwest– with no downtown and strip mall type stuff out on the highway. Very sad indeed. There’s going to be one more empty storefront downtown: Community Resource Bank is moving its downtown office to the Phoenix Building! It certainly seems to be an upgrade in facilities for the bank. Any ideas on what could be done with the soon-to-be vacant building on Bridge Square? Its not much to look at, but it could make a nice community center – or it could be torn down and replaced with a fake old building or two that would better match its surroundings. Patrick- How about a skate park there? Isn’t there a spiral staircase down to the lower level? That would be a nice rail to ride. I’m sure they could come up with some banking turns, also. And if they leave the building intact, it could be an all season skateboard park. There would probably be a lot of interest in an all-year park. John, this is an interesting concept but who would be entrusted with oversight? Patrick & David- I hope you two are not taking me seriously, here. I was just having a little fun with an issue whose solution seems pretty simple to me, but that I believe has been blown a little out of proportion in the last year. Of course, that could be said about a lot of city issues that have come up over the last couple years. John, I think Patrick and I were just following your lead on banking puns. David- Phew! Thanks! What with Griff’s faux news reports, I didn’t want to get anyone off on the wrong account, so thought I should check it out for sure. Any ideas on what could be done with the soon-to-be vacant building on Bridge Square? Its not much to look at, but it could make a nice community center — or it could be torn down and replaced with a fake old building or two that would better match its surroundings. Patrick, I can’t tell if you genuinely want a fake old building there or not. Personally, I hope the future owner of the 25 Bridge Square does not try to make it blend in. It is an eyesore, but not because of the style of the building: because I don’t think it’s really had any updates since 1970. I think, keeping the same basic style but giving it some new spit and polish on the outside would improve it greatly. Even something like eliminating the quirky rock planters and widening the sidewalk would make it much more inviting. And let’s be fair here: it may not be as old as the buildings surrounding it, but I don’t think 40 years is anything to sneeze at. I worry that the public (and possibly a future owner/developer) will be eager to tear it down just because it doesn’t “look historic” enough. I’d just like to see something there that doesn’t look like a cross between an eyesore and a sore thumb. If it could be done with the current structure, that’d be just fine by me. I gather that the building is actually owned by First National. I guess its fate is up to them. Sean- I agree on tearing the building down. It does represent ’70’s architecture, and it is gradually becoming historic. I know there are various disparaging opinions of ’70’s architecture, but it is a period of our history and warrants representation.